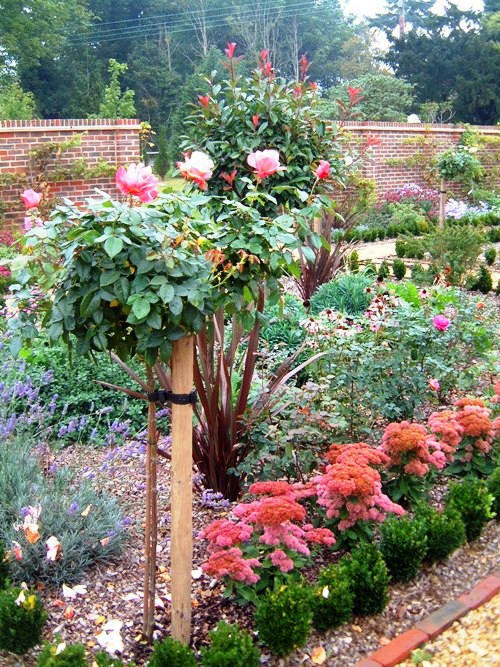 Mockbridge - A detailed planting scheme for a formal courtyard to enhance a fine, period house. 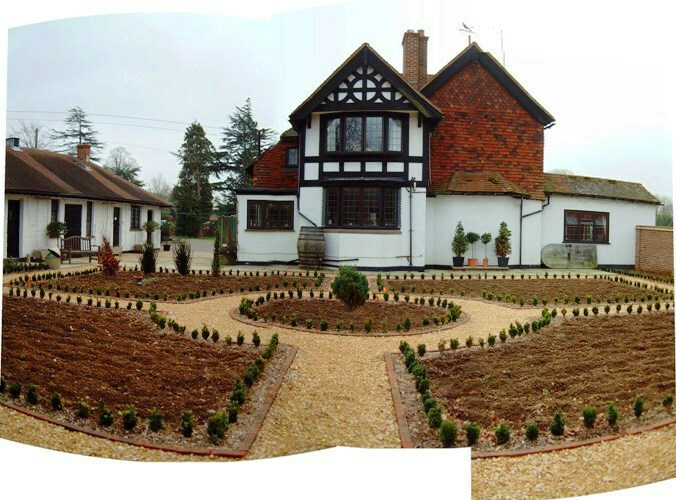 Our client had built a courtyard and laid out the formal patterned beds with his builder. 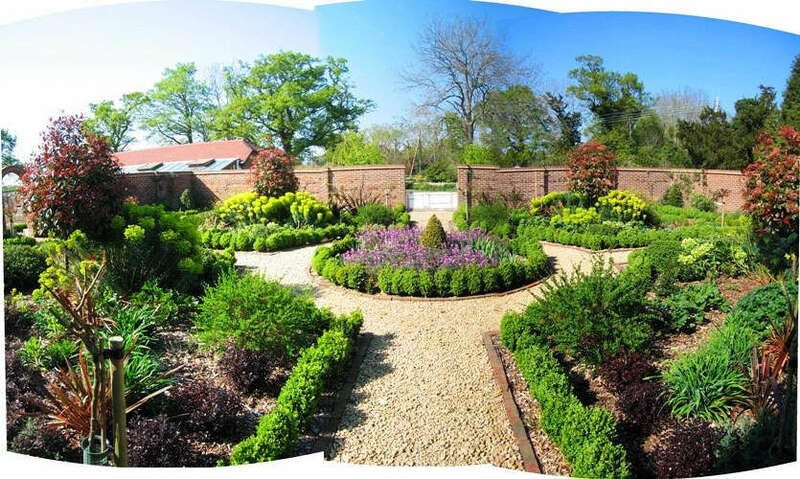 The soil had been prepared and the client was eager to have a full, detailed planting plan. This client has an excellent design eye and good plant knowledge, so our job was to interpret his vision correctly. Above all, he wanted an evergreen structure lit by colour throughout the year. The client needed a designer with excellent plant knowledge to prepare a plan with sketches for his approval then to prepare lists of plants for him to buy. His gardener then planted up the beds to the layout plans. We included elements within the plan that will develop in the longer term to create stunning structural vistas - such as standard Photinias in a pattern of four - that will over time add height and colour to the flat courtyard. Hidden patterns reveal themselves in the planting scheme as the seasons press on, and the three-dimensional structure will also evolve as the years pass. It is important within a developing scheme such as this to have regular maintenance whilst the plants are all at the same height. The rule of thumb is ‘little and often’ to shape and prune the new elements. 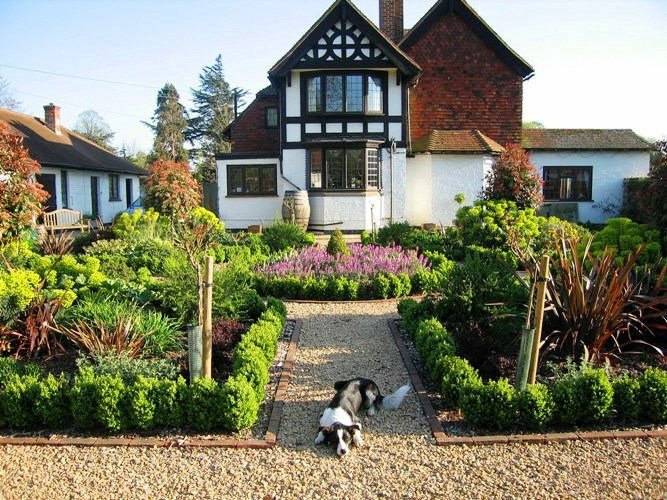 An elegant house, a sunny courtyard, and a faithful border collie. A piece of Heaven on Earth. Fabulous Euphorbia characias wulfenii underplants the standard Photinia bushes. This pattern of planting is repeated throughout the scheme and will become more beautiful and striking as the photinias grow taller and more shapely. The spiky Phormium tenax behind repeats the purple/red motif. Before: the beds as we joined the project. The beds had been prepared thoroughly and tiny box plants edged the planting areas. We saw the area as a blank canvas, upon which we could begin realising the client’s vision. 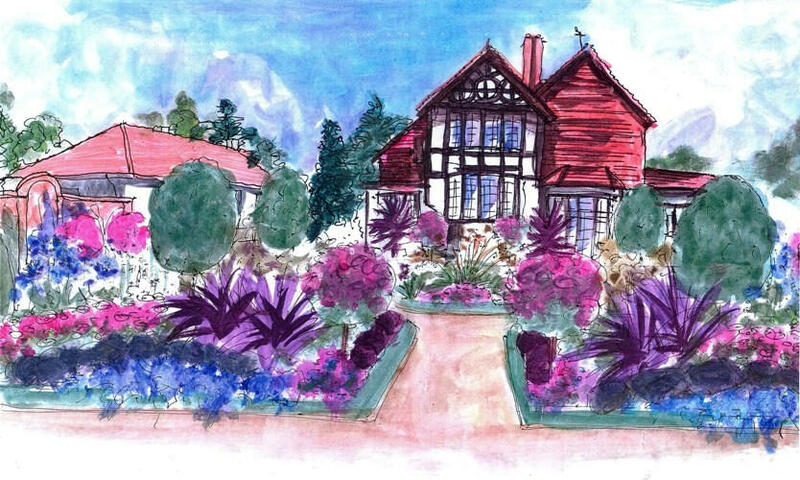 The scheme had to suit the period of the house, and the client wanted voluptuous colour and fully planted beds in a formal but beautiful style. 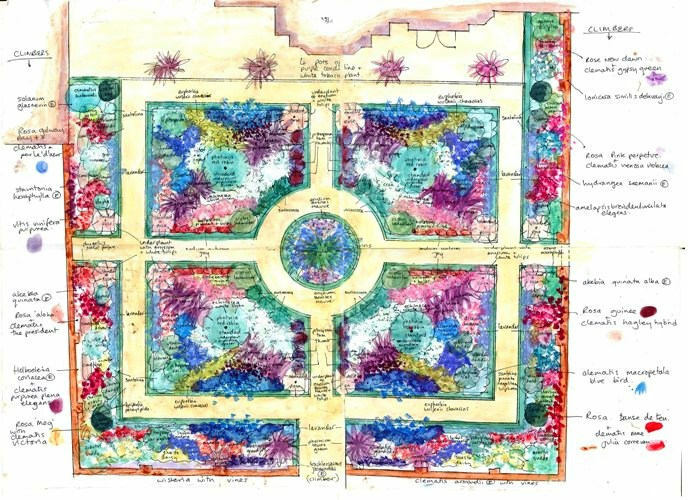 Detailed planting plan by Lovely, Lovely, Lovely. Excellent draughtsmanship combined with refined perspective drawing skills mean that we can produce any type of presentation, and we adapt our approach to suit the individual needs of every client. What we deliver, of course, must allow the client to gain an excellent understanding of the proposed scheme, its feel and its predominant colours. Typically, it is also the key to instructing those executing the work subsequently on the client’s behalf. A plan like this one can often serve both functions. Some clients prefer to see a perspective drawing like this one as well. Our skilled approach allows us to produce very accurate images of the client’s property with the proposed scheme superimposed. Many people find this greatly improves their understanding of how the final scheme will look and allows them to feel confident that the design is exactly what they want. After: planting completed, the patterns begin to emerge. Evergreen plants and shrubs are used generously in our design, so that the scheme looks interesting and colourful all year round - it is never bare or bleak. After: another view of the recently planted scheme. The repeated patterns using specific plants are beginning to emerge even at this early stage in the life of the courtyard. The plants are still very young, but their rich colours give a beautiful show even in the first year. 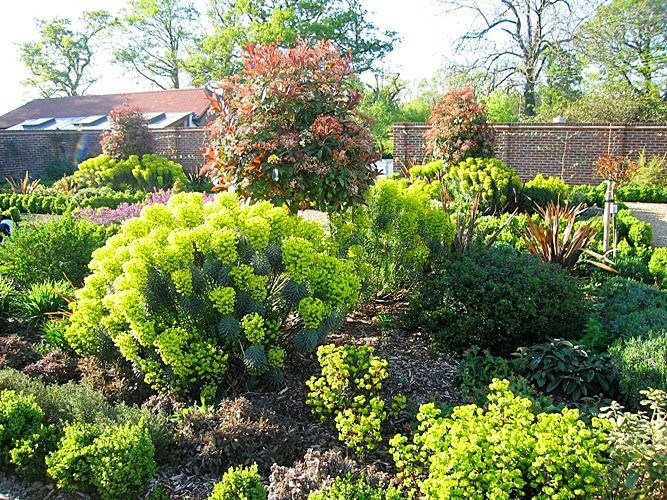 Different varieties of Euphorbia, with their distinctive acid green colour bring the freshness of Spring into the scheme. These plants are evergreens with strong, grey green architectural foliage that lends a different feel and colour as the seasons develop. We carefully chose the plants so that in Spring the colours of the emerging foliage of the woods beyond the courtyard are reflected in the colours in the courtyard, making the courtyard feel bigger and unbounded.